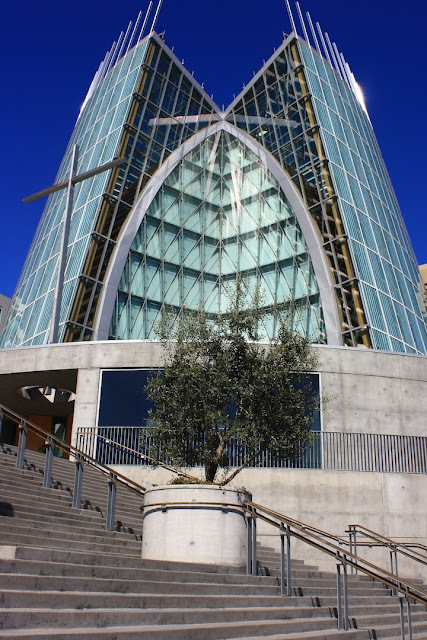 Christ the Light, dedicated in 2008, is situated along the western shore of Lake Merritt. It is the new seat of the local archdiocese. Previous church homes to the diocese were damaged in the 1989 earthquake and were eventually demolished. This new church is a very modern design. Both inside and out it reminds me of a boat which I think is a reference to Christ the fisher of men. In the tradition of old European cathedrals, however, parishioners can be buried in the mausoleum below the main floor. 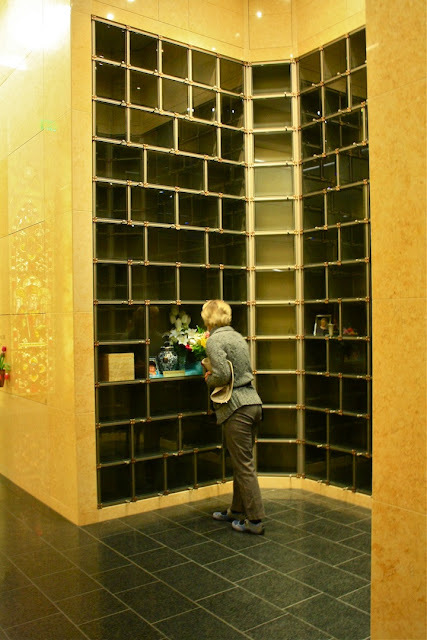 There is room for 1300 niches for cremated remains and 1800 crypts for burials. I'm unaware of any other church in California, except the old missions, doing this. I'm sure someone will correct me if I'm wrong. So far only a small number of these spaces are in use. 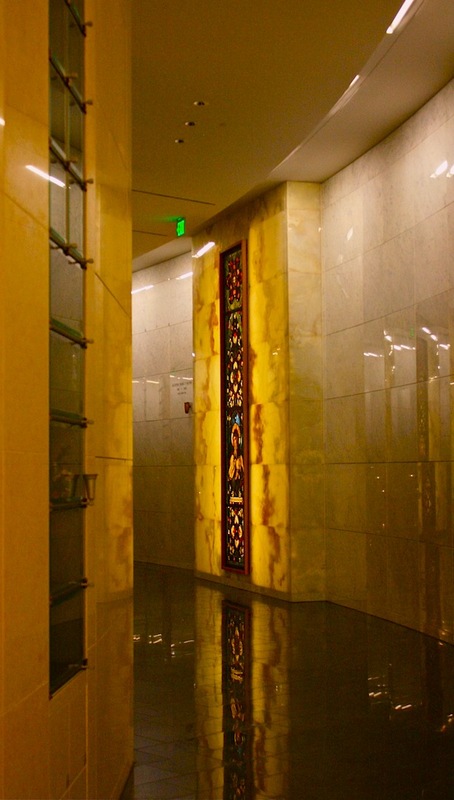 While the crypt walls look like marble, they are actually thin metal which have been treated to look like marble. There are wall sections that look like onyx but may be glass, and are beautifully backlit. Many niches seem reserved for future use, which is probably a smart idea. Those in use at eye level tend toward simple decorations with favorite personal items and informal photos sitting along side the ashes urn. The curving paths lead you to the crucifix seen in the third photo. There you find a previous Bishop of Oakland who was re-interred here in 2008. Several crypts in this section are reserved for future bishops of the diocese. Although a beautiful space, I couldn't help but be reminded that "end of life services" are, above all, a business. Submitted to Julie's Taphophile Tragics where you'll find more musings on cities of the dead. 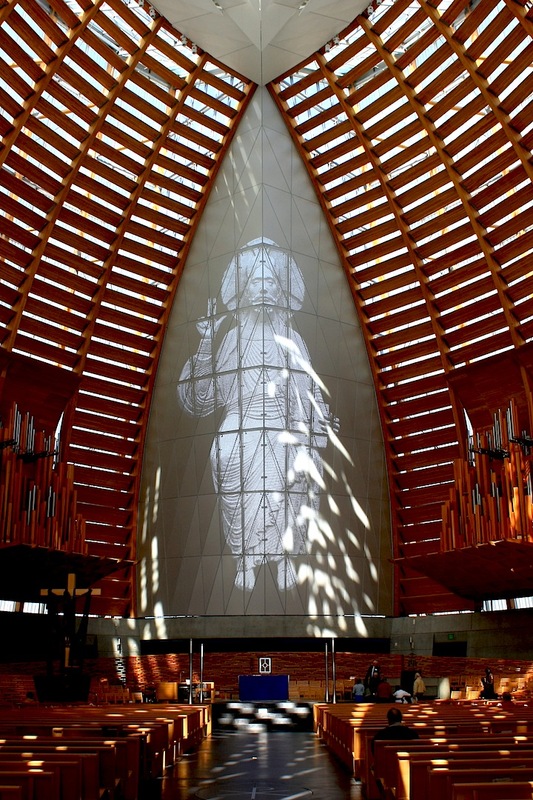 That inside view through the roof of the sanctuary is most impressive! Having a mausoleum in the church building will make sure that this is never deconsecrated and turned into condos when attendance falls..... or am I being too cynical? Lots of info in this post, all very interesting. I didn't know that about the missions have burial places under the floor. I agree with you, funerals are more for the living than for the dead. Interesting church and interesting info you have here. I think it's sort of creepy to "bury" people indoors. This is quite a remarkable church. I'd like to attend a service there. «Louis» wonders if the acoustics in this church are as horrible as they are at St.Mary's Cathedral, San Francisco. Great addition to the meme. I'd forgotten about the mausoleum underneath, though I've been there several times. That is certainly an impressive... or may I say imposing... cathedral. Interesting about the niches. Last Sunday I wanted to go to a temple in Hong Kong that has similar niches, but there the ashes are in spaces blocked by a wall (rather than in urns), with an additional small space for the personal remembrances and miniature comforts for the dear departed. I'll go photograph it next time I'm in Hong Kong when it's not raining buckets. Your questions on my post are hard to answer. In Chinese this is called a grave and in theory it is where the dead spirits reside; but since this is for ancestors who died many decades and even centuries ago, it is unlikely that there were any real remains to disinter and rebury, so we would probably call it a memorial. Nonetheless, not too far from this spot there were some smaller graves in the same style for more recent burials, so this is most likely the area where this clan was always buried. Am I making any sense? LOL! Fascinating. Gorgeous architecture. Interesting about the internment niches. I know that, especially in San Francisco, there are very, very few places to be interned. Very impressive church and beautiful design. wow that is indeed a very impressive church. what about that image of jesus? is it a sculpture or a projection? i would like to visit this church!! Simply mindblowing church. Some fantastic captures of it. Which branch of Christianity does this church represent, Carolyn? It certainly appears to be flourishing, and well supported by parishioners. However, to my senses it appears a bit shallow? Is that being harsh? Yes I can see some of its beauty, especially in your first image. I found myself comparing it to somewhere like Notre Dame in Paris, say. Which I realise is unfair, and plain dumb. That was another time, another place. And 'Christ the Light' is simply doing the same thing in this place at this time. However, it does seem garish. And yes. A business.So much for the concept of 'ashes to ashed, dust to dust'. The sooner we humans can divest ourselves of individual hubris, the better society will be. But that is just my opinion. Gorgeous architecture and your photos are excellent! Quite an amazing church! Excellent shots, thanks for the tour. 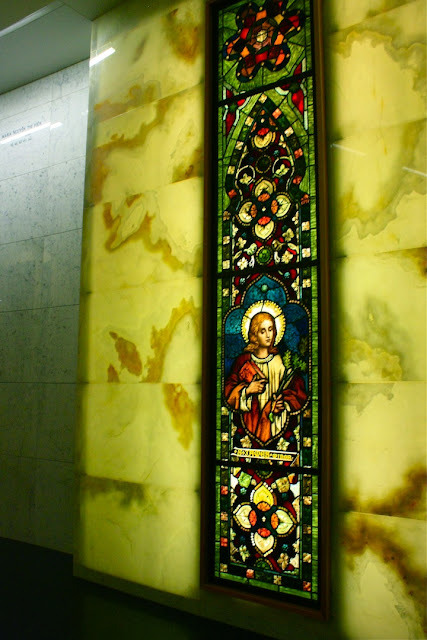 In Saint Peter´s church in Malmö people also were buried under the floor which led to a frightful smell in church. There are saved floor plaques from these times saved in the church. There is one with an skeleton on from a plague epidemic and there are medieaval roof paintings as well with death playing cards. Of course only the rich were buried inside the church. 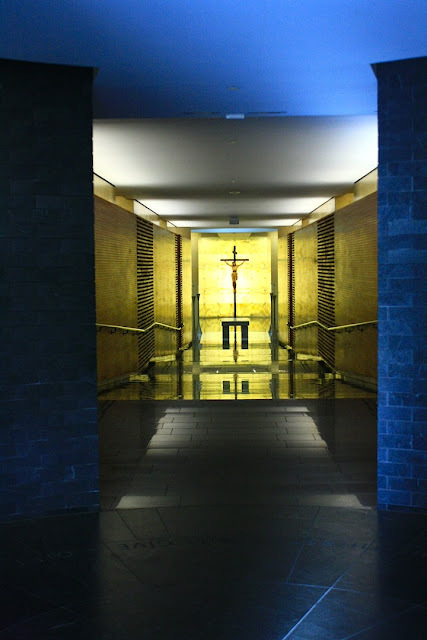 Thank you for the beatiful pictures of a modern church! Wonderful photos of this great Cathedral! Awesome photos! I like the architecture and the interior. I'm adding it to my places to visit list in the Bay Area. I'm sure Jesus would have found something better to do with his money, especially in Oakland. Say what you will about it's aesthetical value, my friends believe it looks like a portion of the female anatomy that Bishops are unaware of. Great blog btw, I'm glad I found it. Great job .Thanks for sharing such an amazing blog.Keep up writing.